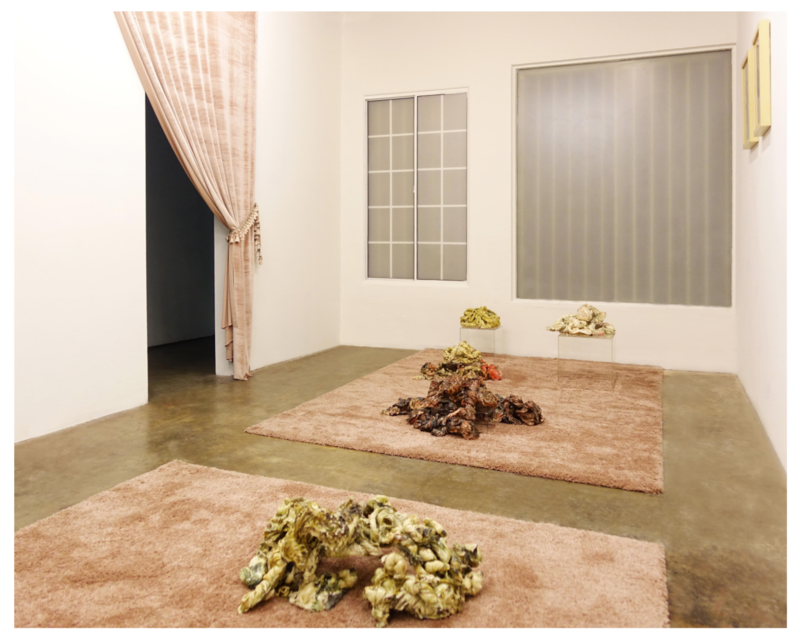 On entering Lauren Davis’ solo exhibition Unnoosed and Straight at SADE, LA you are noticeably greeted with an environment of order: a draped pink curtain matches a shaggy pink carpet and digital prints framed on the wall have been organised in pairs. 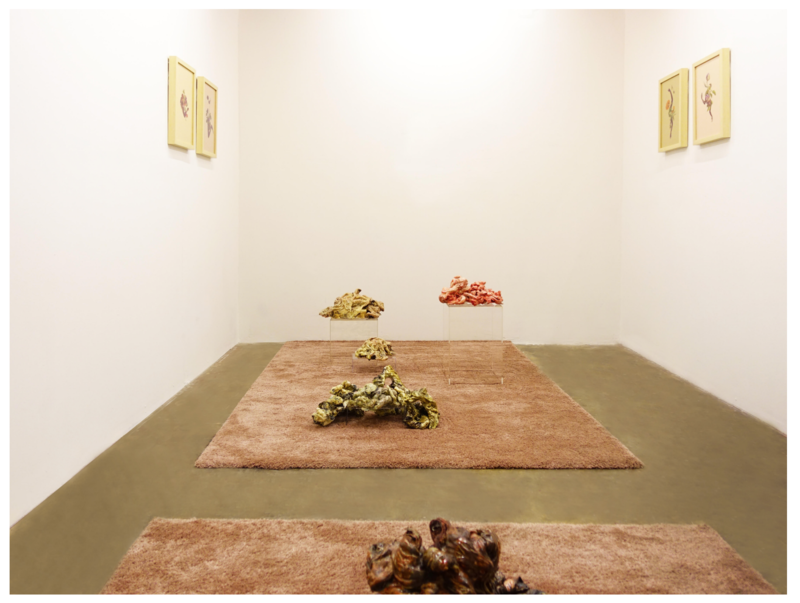 Ceramics have been placed either directly onto the rugs or on perspex plinths. The plinths are also on the rugs. Nothing directly touches the floor. The exhibition – already suggested in its title – engages with the paradoxes of ‘femininity’ from what curator, Kate Eringer has described as a “critique from a place of confinement”. This place of confinement is made apparent in the set up of the room. Organising the digital prints in pairs follows the set up of botanical studies. The digital prints are delicate studies of plants intersected by limbs that spout outwards in graceful poses. 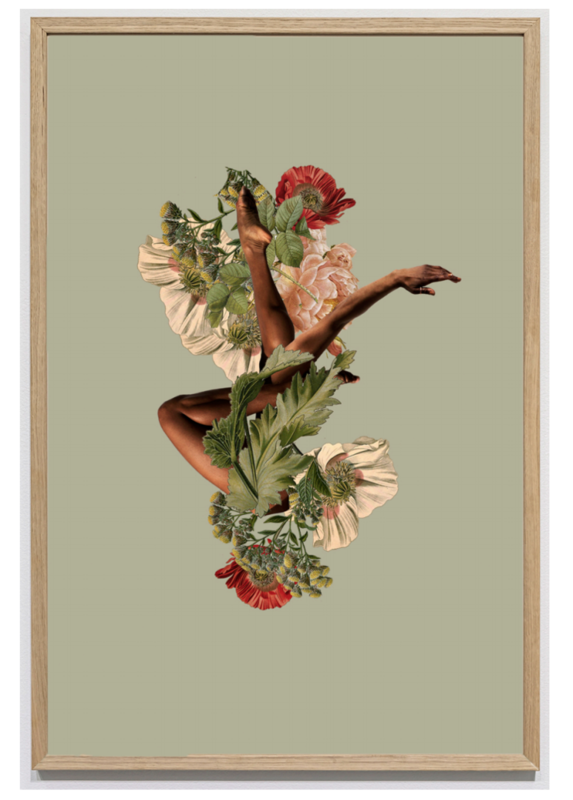 These limbs are offered up in the same space that a scientist would study a plant, suggestive of the ways female bodies have been prescribed as objects for dissection. The use of a curtain at the entrance and two rugs on the floor inevitably reminds you of a domestic space. A domestic space, is of course, immediately recognisable as a place where the ‘feminine’ or ‘woman’ resides. The ceramics are bundles of what look like organically formed rags. They are slumped in contrast to the delicacy of the digital studies. They are made from either stoneware over textile or porcelain over textile, rendering what would otherwise be a movable and malleable material into something hard and stiff. Again, the use of textiles is a deliberate engagement by Davis with traditionally female materials. Positioning the ceramics on both perspex plinths and directly on the floor comes across as a somewhat ironic move. Raised on the plinth, they mirror the botanical display of the digital prints, as something to be studied. But right next to these, are others simply slumped on the rug pointing to the potential illegitimacy of their raised counterparts. The exhibition’s combination of objects and images to be studied and objects and images that exist as raw, organic forms engages with the long and inconsistent history of women as something to be studied, understood and ultimately, controlled. Instead of moving away from supposedly feminine motifs like decoration and the domestic, Davis seems to be actively utilising this rhetoric and aesthetic in what becomes an almost off-kilter set. Tabitha Steinberg is a London based artist and writer who primarily works in media such as video and sound. She is particularly interested in the crossover between art and technology. She is currently studying Fine Art in London and writing her thesis on Francis Alÿs and Abbas Kiarostami’s use of the car in their work. This entry was posted in Art Reviews., Art Stuff Los Angeles, EXHIBITIONS and tagged Lauren Davies, SADE L.A.. Bookmark the permalink. ← New Picasso museum with the largest collection of his work ever, to be opened by stepdaughter.